A multi-level museum showcasing 6,000 years of history is slated to break ground Iquique, Chile, and Studio Libeskind has revealed the first look at its dramatic, seemingly-fragmented building. Iquique is a port city in the country’s north that, while built on mining, has transitioned towards a tourism economy in recent years, in part owing to the abundance of natural biomes found together there—mountains, desert, and the ocean all lie in close proximity. 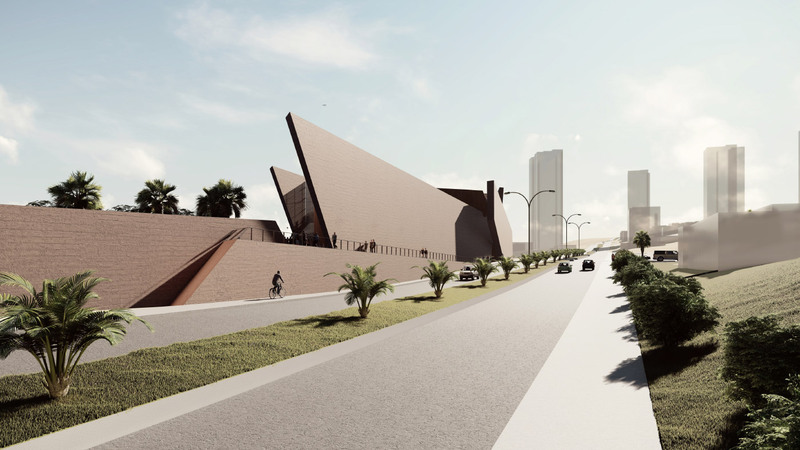 Appropriately enough, Studio Libeskind has drawn on the lush natural environment for the design of the new home for El Museo Antropológico Regional de Iquique (Regional Anthropological Museum of Iquique). The new building will replace the anthropological museum’s original home, where it has existed since 1892. While the current building can only display 20 percent of the museum’s collection, the replacement—which Studio Libeskind has dubbed “El Dragon de Tarapacá”—will be able to put 6,000 years of history on display. Focusing first on the indigenous peoples of the nearby Atacama Desert, the museum will also cover colonialism, nitrate mining in the region, and history up to modern times. El Dragon de Tarapacá was designed to harmonize with the surrounding landscape. Using three pairs of jutting, vertical walls, the massing of the museum references the Atacama Desert, nearby dunes, mountains, and the adjacent coast. The design team opted for a mixture of earth-colored concrete, which is intended to resemble the local stone historically used for construction in Iquique, and hardwood for the interiors. Programmatically, over 40,000 square feet of exhibition space will span two levels. A café over the entrance hall will look out over the shore to the south, while the educational spaces, such as classrooms and a theater, will be located below the entrance. Beneath that will sit the administrative spaces and offices, with underground parking below. 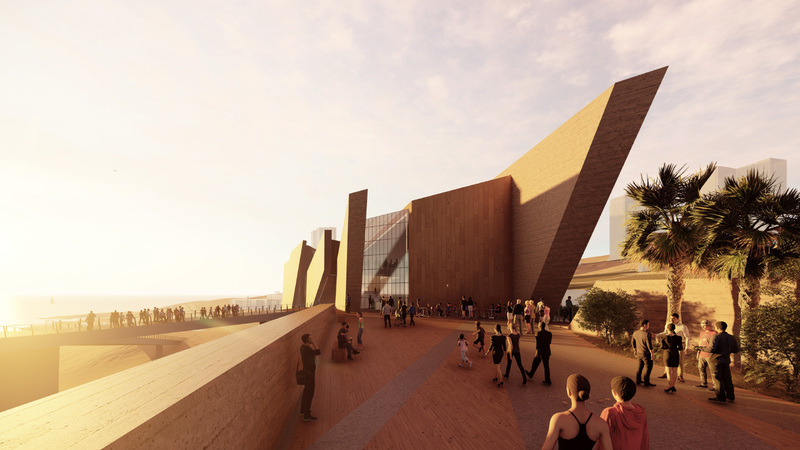 The new museum will sit between two roadways leading into Iquique’s urban center, and on a serious grade. The topmost road is approximately 26 feet higher than the lower street. That means an elevated ramp was needed to unite both halves, creating a pass-through to the beach between the two streets for the first time. A sloped garden will rise from the lower side as well. Construction of the new museum is expected to begin in early 2020, though no completion date has been given yet.